Please forget the unnecessary abomination from 2006, this is the one and only version of this film as far as I’m concerned. The Wicker Man is a film that shows the sacrifice of the belief in the new god to appease the old gods. That’s something that really wouldn’t get made today! And if it did, can you imagine the hoopla it would stir up? 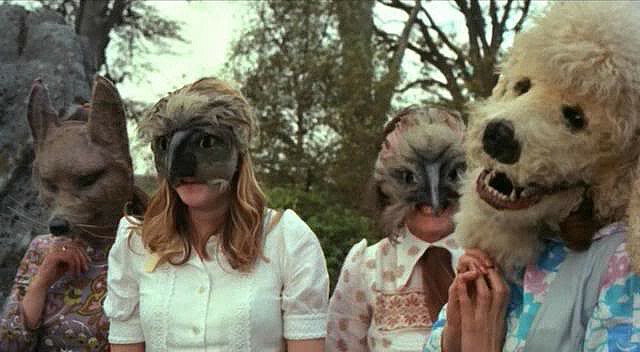 Tonight the 101 Horror Movies brought me to the cult classic British film, The Wicker Man. This is far from your regular horror film, and yet, there is very creepy vibe seething under the rather placid and peaceful looking surface of the film. 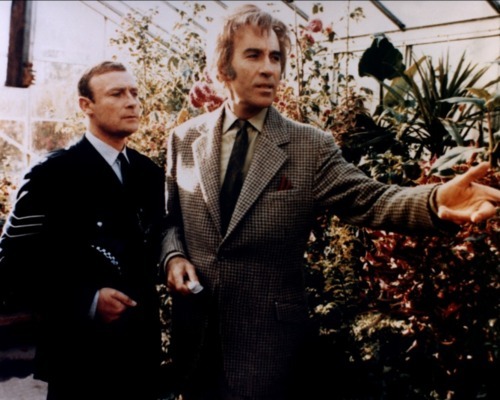 The Equalizer, sorry, Edward Woodward, as Sergeant Howie, a police inspector who travels to Summerisle, off the English coast, to investigate reports of a missing girl. On arrival, Howie learns that this isn’t your usual village, though he can’t quite put his thumb on it, though there are numerous occasions of ribald behavior that clashes with his almost puritan beliefs. It grows odder, when people at first deny that the girl is missing, and then as he digs deeper, learns that she’s dead, or is she? He’s opposed by Scaramanga/Dooku/Saruman himself… Christopher Lee, who seems to be relishing the role of Lord Summerisle, the head of the island and the village. Britt Ekland, the landlord’s daughter, tries, in vain to seduce him, and the whole town seems intent on manipulating him and positioning him for their own designs. There’s something unnerving about the film, the acoustic songs used throughout the film, the masks used for their May Day celebrations, and the fat that the most creepy things that happen in the film happen in bright sunlit scenes. As Howie is cut off from the mainland, he is forced to pursue the case on his own, investigating not only the missing girl (or is she?) but also the practices and belief of the island. He uncovers pre-Christian beliefs and worship, which clashes with his own, and which he automatically thinks is wrong. Especially when he learns that it’s the practice to offer a sacrifice to the gods in return for a productive harvest. The Wicker Man is an unusual experience, a horror film that’s most terrifying moments happen in broad daylight, as beliefs and authorities clash, as Howie slowly realizes he’s been toyed with all along. The last scene is of horrific, even if you’ve seen the remake, even if you KNOW what it is, it’s still horrifying. There aren’t many films that can have that kind of impact. Then, of course, as the credits roll, you’re left with your own thoughts and beliefs about whether or not the wealth and prosperity of the island returned the following year. My personal thoughts… I think maybe it did. Previous Post Niagara Falls Comic Con! !